Metal Tech 4x4 FJ Cruiser/4Runner (2003-current) rear long travel progressive rate heavy coil spring. This progressive rate spring will give you a total of 27" of articulation when combined with our custom made FJ Cruiser/4Runner Icon 2.0 VS Series Shocks, FJ Cruiser Rear Extended Brake Lines, and Metal Tech 4x4 3" Bump Stop Drops Extensions. When we first installed our Total Chaos FJ Cruiser 2" Long Travel Kit we were so impressed with the increased suspension travel and ability to fly through the whoops at high speed the rear axle couldn't keep up! One of the biggest disadvantages of the FJ Cruiser is the limited suspension travel. With Metal Tech 4x4's long history of specializing in the Toyota FJ40 Land Cruiser we took our rock crawling knowledge and set out to make the FJ Cruiser a more capable trail rig. 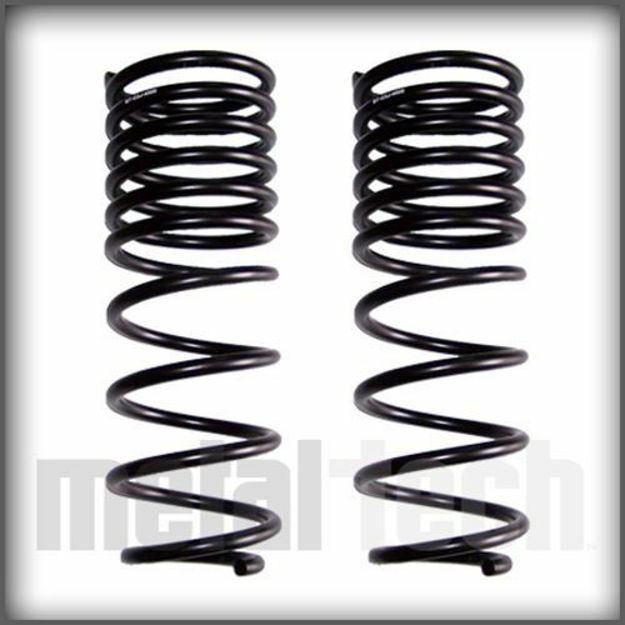 Metal tech 4x4 Next Gen dual rate Long Travel rear springs. We have taken the knowledge and performance we have gained over the past 5yrs of our long travel systems and wrapped it into the single best performing Next Gen spring to date. Now Right and Left specific. These are the only rear springs on the market for the FJ Cruiser/4 Runners and Prado 120 platform trucks that are engineered as LEFT and RIGHT rear springs. Specifically engineered for North America Left hand drive vehicles each spring has a different spring rate to counter the common lean most Prado 120 platform trucks experience when lifted. This is especially helpful for heavily loaded trucks with rear bumper systems, drawer systems etc. However still very visible if not more so with lightly loaded trucks. The drivers spring is 3% difference over the passenger side to account for the Toyota Lean.